Most Trump voters believe that President Donald Trump has stopped the illegal alien caravans at America's borders to keep asylum seekers in Mexico through orders to the Department of Homeland Security (DHS), which oversees our Border Patrol and ICE agents. Unfortunately, this is not true and fits into the pattern of many false promises and statements emanating from Donald Trump and the White House on immigration issues. At this time, the Trump administration is continuing the costly and deadly Catch and Release program by which illegals are simply given tickets to appear at future court dates in the jurisdiction of their choosing. It should be no shock to anyone that the vast majority never show up in court, are not tracked or locatable, and are never deported after being handed such a worthless ticket. There are reports that illegal aliens are now starting to complain about how long it takes our Border Patrol to pick them up from the point where the drug traffickers drop them off. Illegal aliens look forward to being "apprehended" by US Border Patrol because, within a few days, they will be clean, dressed in clean clothes, fed, medicated, and transported inland in air-conditioned taxpayer-funded DHS buses under President Trump's control to be dropped off at invasion supporting churches in Phoenix, AZ, and San Diego, CA. If you don't want to believe this because you heard President Trump promise these illegals would not be allowed into America, we have news reports from Phoenix and San Diego that prove it. While Trump and the Mexican officials did briefly stall the caravans in Mexico to prevent the optics of them tearing through our border patrol checkpoints and triumphantly marching into conquered America, Breitbart News started reporting on November 14, 2018, that Mexican federal police started escorting these caravan illegal aliens to our border for processing. The reports indicated that 60-100 illegal aliens per day were being processed into the USA. The facts documented in these articles and videos, that illegal immigrants in the caravans are receiving the red carpet treatment into the USA after they are forced to wait briefly in Mexico so as to decrease the alarm level of outraged US citizens, directly contradict what Trump tells the media and the public! On November 22, 2018, Bradford Betz and Edmund DeMarche of Fox News reported, "Asylum seekers will have to wait in Mexico as cases are processed under new plan." Their report was based on a Washington Post story which cited "internal planning documents" and three unnamed officials in the Department of Homeland Security. And while the DHS said they had no immediate plans to implement this leaked report, the misleading Fox News headlines were still waved in the faces of Trump voters. But then Trump stepped in to bolster this false belief with his own words on December 11, 2018, as reported by Breitbart's Charlie Sperling in "Donald Trump Claims Victory over Caravan Migrants; Demands Wall." "President Donald Trump asserted Tuesday that border enforcement agents had successfully turned back the caravans of migrants trying to enter the United States, despite reports of increased illegal border crossings. “Despite the large Caravans that WERE forming and heading to our Country, people have not been able to get through our newly built Walls, makeshift Walls & Fences, or Border Patrol Officers & Military,” Trump wrote on Twitter. In November 2018, there were nearly 52,000 border crossings on the southern border, the highest number of illegal immigrants in the month of November since 2006. Trump highlighted reports that some of the caravan migrants were accepting work in Mexico as they waited for their chance to enter the United States. Trump argued that the border was “secure” despite reports claiming the opposite. 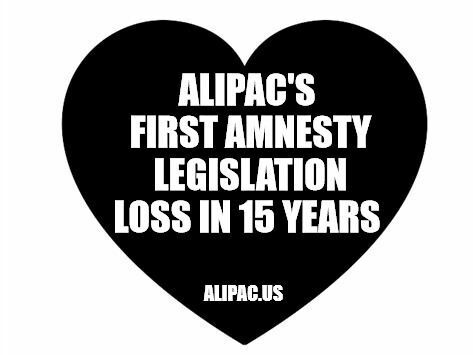 To be honest, these claims shocked many of our ALIPAC volunteer activists and researchers at www.ALIPAC.us who monitor these issues closely. At one point our research team caught Trump flat out lying on Twitter about the first two caravans he let it. (Review) The following Tweet is false unless by "stopped" Trump means "Stopped at the border briefly before we let thim enter in small groups." The border is obviously not secured; illegals are pouring in at historic levels, encouraged by Trump's Amnesty pushes and inaction on real border security. The caravan illegal aliens are obviously not being kept in Mexico, according to Facebook Go Live videos and numerous news reports. Trump's statements were obviously detached from reality either intentionally or unintentionally, and if by mistake, how could the President of the United States be so wrong on such an important matter like the invasion of America? The problem and disparities were further confirmed Jan 6, 2019, when Kate Morrissey of the San Diego Tribune reported, "Two weeks later, no sign of 'Remain in Mexico' policy in action at San Ysidro Port of Entry." Morrissey reports, "More than two weeks after the Trump administration announced a new policy that would force asylum seekers to wait in Mexico for their turns in U.S. immigration court, there is no sign yet at the San Ysidro Port of Entry that it has been implemented." The great roller coaster of what Trump says and promises versus what actually happens is not over yet. It appears the caravan illegals Trump said were not going to be let in are now going to be returned to Mexico. It's illegal for asylum seekers to stay in Mexico while applying for asylum! For the United States to be secure and prosperous, we must have honest leadership that keeps campaign promises and tells Americans the truth. The truth is what is missing from the media and government today, and while Trump campaigned as a "Truth Teller," his deeds have not matched his words. If you are a concerned American reading the news in horror about the three new illegal alien caravans that have formed and are moving towards our southern border, please know they are coming because the others have mostly been allowed into America. They have phoned home like E.T. and told friends and family in Mexico, Honduras, Panama, Brazil, China, Russia, and India that they were escorted into America by socialist and Zionist refugee aid support groups, the Mexican federal police, and the USA Border Patrol and Department of Homeland Security under the management of Donald J. Trump. They are now cozy and secure in the socialist states of America where their food, housing, healthcare, education, and cell phones are all being paid for by American taxpayers and consumers! No wall across our whole border would defend us from these practices and dishonest politicians. Here is our national press release on this matter (View), please help us circulate this report and release to warn more Americans of the truth about our borders, politicians, and the illegal alien caravans. 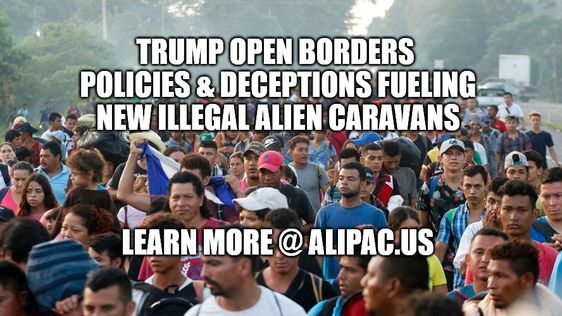 "We know from prior Trump deployment of troops to our border that any soldiers sent to the border are under specific instructions not to engage, detain, or stop any illegal immigrants as Trump deceptively wants Americans to believe," explained William Gheen, President of ALIPAC. "While it is true Trump wants to stop large caravans from entering as a group and putting his open borders policies and hypocrisy on full display; Trump is allowing most of these illegal alien caravan members into the USA in small groups of around 100 per day. These latest caravans are coming because Trump let the earlier caravans in, and those illegal immigrants are calling people back home reporting their food, housing, transportation, cell phones, healthcare, and education are being paid for by American taxpayers and consumers. These open borders policies and deceptions by Trump will bring in more illegals in the future." Released to the media Feb 1, 2019. Please tell Trump to stop misleading us, misinforming us, contradicting himself, and allowing illegal aliens to enter and remain in the US unlawfully, which violates our laws, Constitution, and his Oath of Office. Last edited by ALIPAC; 02-01-2019 at 05:33 PM. One hundred Russian migrants arrived in Tijuana, headed to U.S. 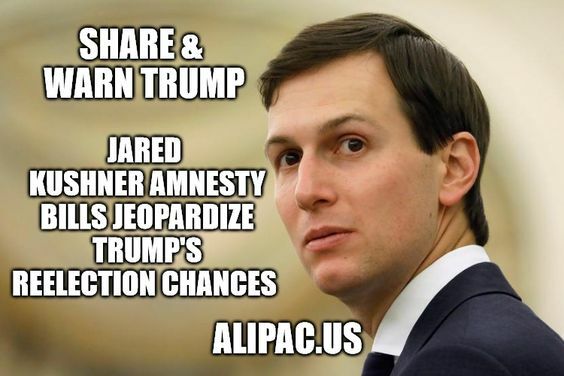 Call the White House 202-456-1414 and call Senator Rick Scott 202-224-5274 (View details HERE) to oppose their support for Amnesty for illegal aliens at the hands of Jared Kushner!